Manila, Philippines - Network giant ABS-CBN announced today, April 5, 2014 the Last Chance Auditions schedule for Pinoy Big Brother (Season 5), which is called PBB All In. 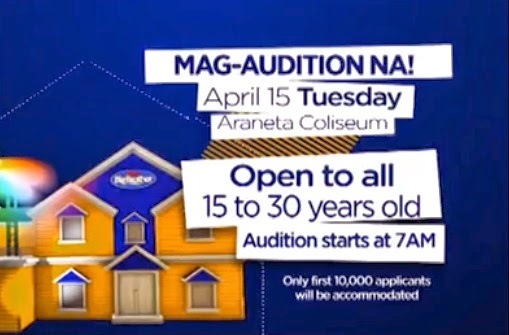 In the promotion video, the network says that last chance audition is set on Tuesday, April 15, 2014 at the Smart Araneta Coliseum, Cubao, Quezon City. Big Brother (Kuya) is looking for happy and positive aspiring Housemates ages 15-30 only. Audition starts at seven (7) in the morning and the first 10,000 auditionees will be accommodated. The Official Twitter account of PBB said that age requirements is strict, meaning, those turning 15 before the said date are not qualified to join the audition. Big Brother Secretary said on Twitter that there's no other requirements. Just bring yourself at lakas ng loob #PBBALLIN RT @PurpleChixxx ano po bang mga dadalhin?! Birth cert.po kelangan pa po ba yun? Valid i.d.?! [ Make sure to bring your birth certificate and a valid ID indicating your birth date. ABS-CBNN announced that the registration and queuing area will be at the Open Parking Lot B (in front of Padi’s Point near the Araneta Coliseum’s Red Gate). All aspiring housemates will be issued a ticket by the Araneta Center and a sticker by “PBB.” Only those with issued tickets and worn stickers will be allowed inside the venue, as the audition has a one ticket and one sticker per applicant policy. The venue also has a no re-entry policy, so aspiring housemates are discouraged from leaving the Araneta Coliseum once they’re inside. If they wish to go out, they will not be allowed to enter. PBB also said that currently no decision has been made if there will be an ONLINE Last Chance Audition. In the first PBB Twitter Hangout, Diker Lauren said that the brand new season of PBB will be launched after Easter or expected this April 2014. A total of 33,064 aspiring housemates auditioned this season with 11,265 submitted online audition videos. 11 have been shortlisted from Davao audition, 22 from Cebu, 138 from Manila auditions, 22 online and 3 referrals. PBB and ABS-CBN management is still in the process of final casting for PBB All In. Follow Us on Twitter or Like Us on Facebook to receive more updates about PBB All In. You may also subscribe to our E-Mail List.